When I started driving, cars were generating very little data. They got you from A to B without the addition of gadgets or gizmos. Connected cars as we know them today were certainly not a thing. Today many vehicles are computers in their own right, connected to the Internet and data is flooding in. In fact, it’s estimated that a single connected car uploads 25GB of data to the cloud per hour. With a quarter of a billion smart vehicles set to be on the road by 2020, that’s over 6 billion GBs every 60 minutes. Such vast amounts of data are only going to continue growing in the years to come, putting the automotive industry in a leading position within the Internet of Things (IoT). But at the same time a growing number of challenges and pressures are becoming apparent – namely the need to process, analyse and store all this new information. As a result, datacentres are fast becoming the solution to the automotive sector’s rapid data growth, but how exactly are these data halls driving the connected car revolution forward? For the past few years, connected cars have been the hype of the sector. By ‘connected’, we mean vehicles that have access to the internet in some form; cars that are often spotted with sensors that enable machine to machine (M2M) and machine to human (M2H) communication. As already noted, this level of connectivity generates substantial data sets. The industry is continuing to innovate rapidly, and before connected cars even become commonplace, conversations are shifting to autonomous (or self-driving) vehicles – the futuristic Hollywood vision realised. Here we’re talking about vehicles that operate without a human driver. While this could well give rise to many transportation efficiencies (reduced driving costs, improved convenience etc.) it will also undoubtedly bring about a more drastic automotive data revolution. If one connected car today generates 25 GB of data an hour, one autonomous car in the future is likely to generate ten times that information. On top of all the data a connected car generates, self-driving vehicles will have to be truly intelligent – learning how to their ‘drivers’ like to drive, sensing the physical environment around them, broadcasting location data and interacting with other vehicles and objects to traverse the roads safely. By producing data on data in this way, autonomous cars will require even quicker analysis and bring entirely new elements of machine learning to the mix. Which means beyond M2M/M2H communication we must also consider vehicle to vehicle (V2V), vehicle to everything (V2X), vehicle to infrastructure (V2I) vehicle to person (V2P) and vice versa (P2V). The resulting complexity and scale of automotive data sets means more and more automotive giants are recognising the need for complex computing to drive their businesses (and vehicles) forward. In turn, this has resulted in an exponential growth in the number of customers from the automotive industry turning to external data centre providers to meet their Big Data and High Performance Computing (HPC) demands. The need for scalable, secure HPC datacentre solutions is therefore being felt keenly. For many auto-companies, these kind of data hubs are not necessarily those on their doorstep, and IT decision makers are looking to colocation datacentre providers to support their HPC operations, by supplementing compute capacity and improving operational costs. In order to support the rapid innovation the automotive industry is showing at present, such campuses must present an ‘HPC-ready’ solution – offering the expertise to support the management of information loads as quickly, efficiently and successfully as the automotive experts that have been handling complex vehicle data for decades. More often than not, these are remote facilities with the power infrastructure, resiliency levels and computing resources needed to process HPC loads cost-effectively. Moving automotive HPC workloads to campuses with inherent HPC-ready capability gives automotive manufacturers the medium and high power computing density required at significantly lower energy costs. Ultimately that enables the ability to gain more insight from more data, and moves us closer to the benefits of autonomous driving. A number of automotive leaders have recognised these benefits, and are already reaping the rewards. One such manufacturer is Volkswagen, which recently announced the migration of one megawatt of compute-intensive data applications to Verne Global’s Icelandic campus in order to support on-going vehicle and automotive tech developments. Likewise, BMW is a well-established forward-thinker in this area, having run portions of its HPC operations – those responsible for the iconic i-series (i3/i8) vehicles, and for conducting simulations and computer-aided design (CAD) – from the same campus since 2012. These automotive leaders consider Iceland an optimal location for their HPC clusters – not only for the energy and cost efficiencies it delivers, but the opportunity it allows them to shift their focus from time-intensive management of the technical compute requirements of their day-to-day work to what’s really important: continued automotive innovation. Even so, wherever automotive data is stored, analysed and understood one thing is for sure: HPC – and the datacentre industry as a whole – sits in the driving seat of the intelligent automotive revolution. It will advance our understanding of auto-tech, smarten our driving behaviours and ultimately carve a path to the coveted driverless and connected car technologies that will radically change the way we travel into the future. Bosch is making the map display on built-in navigation systems even more engaging and relevant. Buildings extend skyward, enabling you to get your bearings more easily, and visible changes in terrain height combined with integrated satellite imagery produce an almost photorealistic look. This is made possible by Bosch’s advanced navigation software, which takes data compliant with the new Navigation Data Standard (NDS) and processes it in a 3D rendering module to turn it into a visually stunning map. In contrast to comparable solutions, it is possible to use the Bosch approach on navigation systems that are not permanently online. If an internet connection is available, though, the system can enhance the map display with dynamic data. In the future, this will allow, for instance, integration of the latest weather information or fuel prices at gas stations along the route. 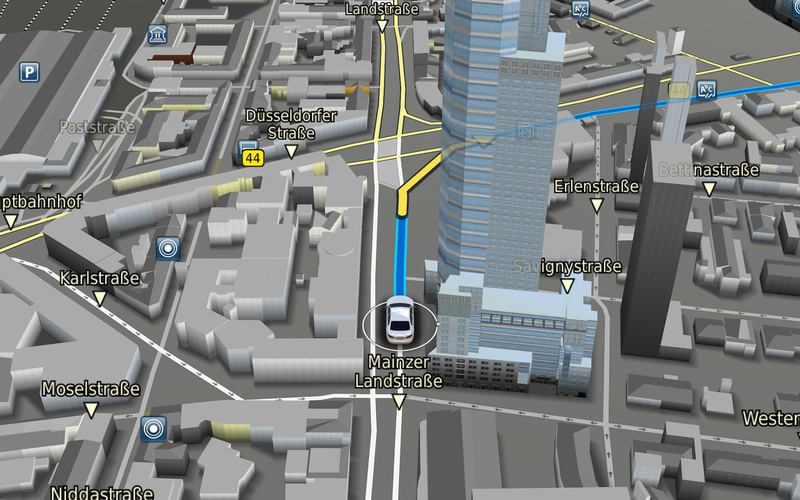 The key component in Bosch’s new navigation software is a 3D map engine based on OpenSceneGraph. 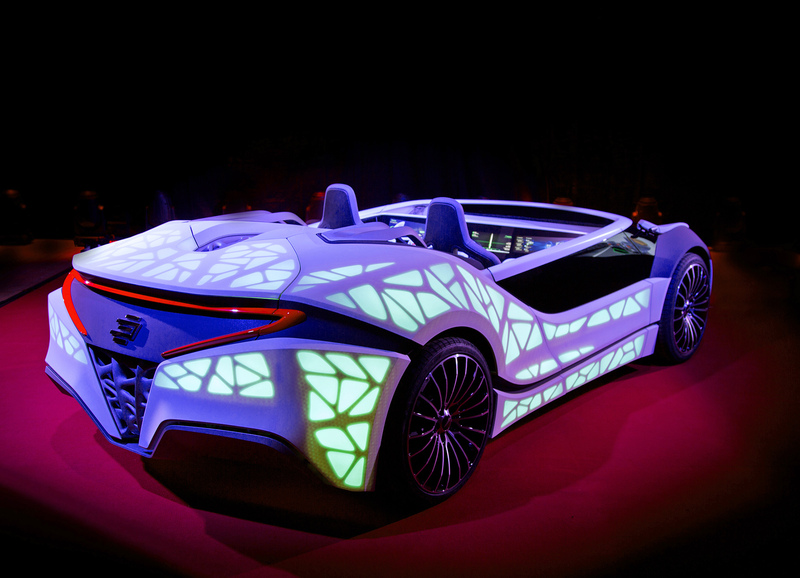 It superimposes three-dimensional elements like buildings using an additional display layer and can also make them transparent, keeping the route visible to the driver when it goes behind structures. The driver can smoothly zoom the visible map area, from the highest level of detail to the world view. Using topographical information contained in the NDS data, the software displays differences in terrain height. It will even be possible to artificially bend up the map in the direction of the horizon, thus maximizing the amount of screen area used to display the route. The new software furthermore supports the 3D artMap function, which rounds the edges of buildings and uses appropriate colouring to give the structures a watercolour look. 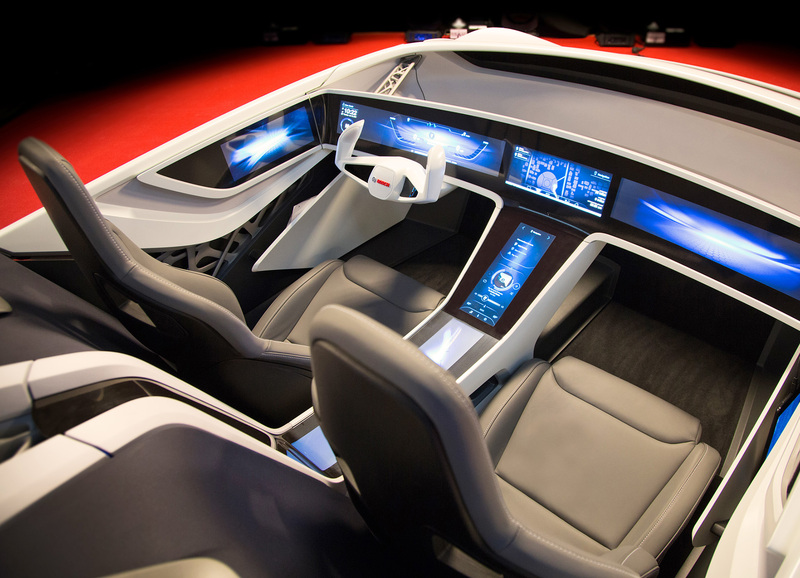 For interacting with the system, the driver can choose between voice input, multi-touch, and handwriting recognition. And thanks to the 3D map engine, it is also possible to show different areas of the map on different screens at the same time, such as the displays in the centre console and instrument cluster. The level of display detail can be adapted to the infotainment system’s computing power and memory. The navigation software can thus be configured to suit carmakers’ particular requirements. Updates are easy to install via USB media or a connected smartphone. Today, traffic congestion can already be portrayed on the map in near real time. But if the infotainment system has internet access, it will be possible in the future to integrate even more information in the map display. The Bosch connected horizon, for example, gives real-time access to data on road conditions stored in the cloud. The 3D map engine is able to visualize this data, so that areas of the map appear in a different colour if there is particularly heavy rain or a risk of black ice. By simply tracing a circle on the screen with your finger, you can then tell the system to calculate an alternative route going through the point you just defined. Regional temperatures and the expected path of severe storms can also be displayed – an essential function in regions of the US severely affected by tornados. Furthermore, in electric vehicles, the system uses a coloured, transparent overlay to indicate the current range on the map for the amount of remaining battery charge. The Navigation Data Standard has been jointly developed by carmakers, automotive suppliers, and map providers. The standardized format enables map data to be exchanged easily between them. Standardization reduces the number of different variants and simplifies map updating. The car of the future? The car: the driver’s truly personal assistant Bosch car-of-the-future will experience a new kind of interaction between humans and technology. The car dashboard and central console have been transformed into an electronic display. The information shown on this giant display changes depending on the vehicle’s current surroundings. If a pedestrian approaches from the right, a lighting sequence is triggered to alert the driver. Drivers’ preferences as well as appointments in their diary are also taken into account. For example, if an appointment is cancelled, the car of the future will automatically indicate the route to the next appointment in the diary. 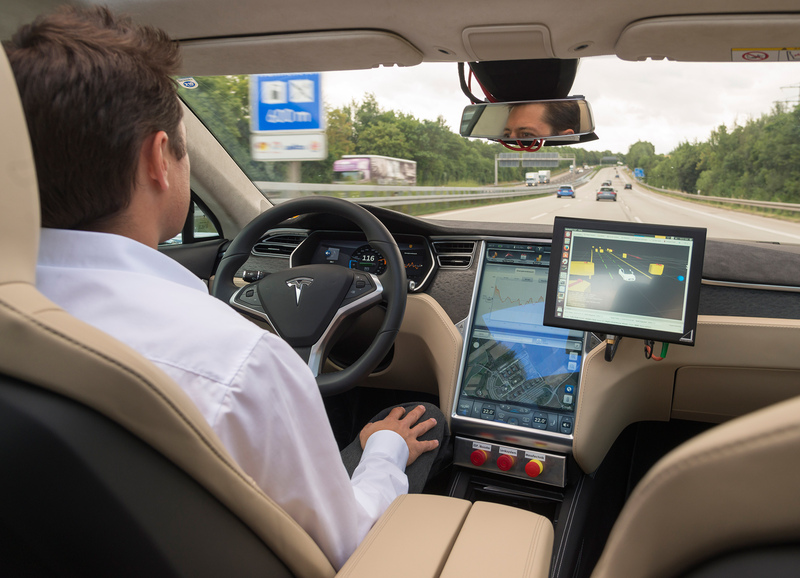 Drivers will be able to activate the autopilot to free up even more time and make their journey more relaxed. But tomorrow’s connected cars will also be capable of much more. With a connection to the smart home, they will enable household functions such as heating or security systems to be operated at any time. For example, should a courier attempt to deliver a package with no one at home, all it will take is the tap of a finger on the vehicle’s display to allow the courier to deposit the package inside the house and confirm receipt. Interaction with technology really will be able to take such varied forms, and offer such safety and convenience. Connected infotainment will let drivers navigate not just through the traffic but through their whole day. They will be able to use it to access online services and smartphone apps – and they will be able to control it using gestures and speech, just as if they were talking with a passenger. This will turn the car into the driver’s truly personal assistant. A touchscreen that feels like it has real buttons In advance of the trade show, Bosch has received a CES 2016 Innovation Award in the In-Vehicle Audio/Video category for a new touchscreen. This device can generate different surface textures, allowing elements to be felt on the display. This haptic feedback makes it easier to operate infotainment applications such as navigation, radio, and smartphone functions. Often drivers will not even need to look at the information on the screen to control it – instead, they can keep their eyes on the road. The screen generates the feel of rough, smooth, and patterned surfaces to indicate different buttons and functions; to make a selection, a button needs to be pressed more firmly. 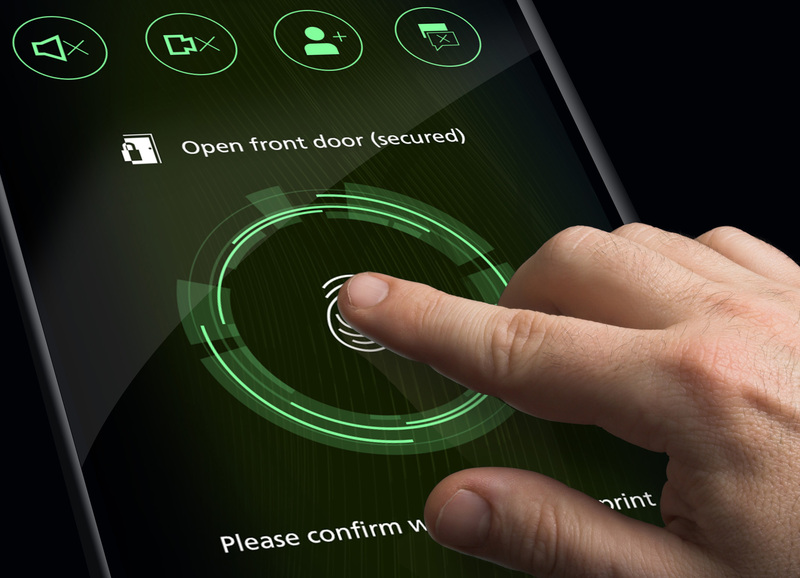 What makes this special is that the touchscreen looks no different from an ordinary display – and yet it gives users the impression that they are pressing real buttons. No need to fear wrong-way drivers: a guardian angel in the cloud Connectivity makes driver information more up to date than ever before. This is particularly important when it comes to wrong-way drivers. In general, it takes several minutes for radio stations to issue warnings over the airwaves, but a third of wrong-way driving incidents finish after just 500 meters. Bosch is currently developing a new cloud-based wrong-way driver alert that will let drivers know of any danger just ten seconds after it arises. As a pure software module, it can be integrated at low cost into smartphone apps such as Bosch’s myDriveAssist or existing infotainment systems. In order to detect wrong-way driving, the cloud-based function compares actual, anonymized vehicle movement on freeways with the permitted direction of travel. If there is a discrepancy, wrong-way drivers are warned of their error in a matter of seconds. At the same time, nearby cars traveling in the opposite direction are alerted to the danger. Starting in 2016, the new function will be available as a cloud service. The highway pilot will increase road safety from 2020 Highly automated driving will further increase the safety of road traffic. This development will come to freeways in 2020. According to forecasts made by Bosch accident researchers, increasing automation can significantly reduce accident numbers – by up to a third in Germany alone. At CES 2016, Bosch will be showcasing the systems and sensors necessary for automated journeys in another demo vehicle at the Sands Expo. Visitors will also learn how the highway pilot works, a highly automated system that assumes all the driver’s tasks and responsibilities on freeways. This technology is already being tested on public roads. Bosch is testing automated driving on freeways not only in Germany and the United States but now also in Japan. In the future, cars will also be able to see around bends and be aware of possible danger spots, thanks to a stream of real-time information from the internet on the location of traffic jams, construction sites, and accidents. This data will serve as an electronic “connected horizon” and give cars an even better picture of what lies ahead – further increasing safety and efficiency. Lawmakers have mandated economical, low-emission vehicles. Car buyers want vehicles that are safe and that offer more convenience and engine performance. At the International Vienna Motor Symposium 2015, Bosch presented numerous innovations that meet all of these requirements. “Bosch technology is making cars more efficient, more convenient, and more fun to drive,” said Dr. Rolf Bulander, member of the board of management of Robert Bosch GmbH and chairman of the Mobility Solutions business sector. All three aspects come together in the Bosch boost recuperation system. In the New European Driving Cycle, the 48-volt hybrid can cut CO2 emissions by 7 percent (based on compact class). Thanks to its electric-supported coasting, the car offers a smoother ride and can deliver up to 150 Nm more torque on demand. Innovative advances will transform automotive powertrains over the next few years. “Electrification and connectivity will give a further boost to gasoline and diesel engines,” predicted Bulander. “Bits and bytes are making cars more efficient.” Electrified vehicles stand to gain tremendous benefits from connectivity. They are safer, more efficient, and more fun to drive. One example of how this works is the connected electronic horizon. In the future, this Bosch technology will supply essential traffic information about construction sites, traffic jams, and accidents in real time. From this basis, it will be possible to further improve existing functions such as start-stop coasting. At the same time, plug-in hybrids can use the system to implement a predictive operating strategy. Such technologies can cut CO2 emissions by a double-digit percentage. In his presentation, Bulander reaffirmed that internal-combustion engines will remain the basis of efficient mobility. Even ten years from now, the vast majority of new vehicles worldwide will be powered by fossil fuels. Europe, the U.S., and China will raise the legal requirements for engine efficiency still further over that same period. Starting in 2021, the average new car in the EU will have an emissions cap of 95 g of CO2 per kilometre. Based on the current situation, advances in engine design should make it possible to achieve these values. The CO2 emissions for a gasoline engine in the subcompact class can be reduced to 85 g per kilometre, and for a diesel engine, that figure can be even lower than 70 g per kilometre. Enhanced aerodynamics and reduced rolling friction could once again lead to further improvements. Vehicles in the premium class and SUVs will need additional electrification. In addition to current emission regulations, engineers are increasingly focusing on real driving emissions. The European Union is discussing whether to introduce real driving emission tests starting in 2017. This measuring method for diesel cars concentrates primarily on the emissions of nitrogen oxides and carbon monoxide in real-life driving situations. For cars with gasoline direct injection, the focus is on the level of particulates emitted. A number of vehicles currently in production already expel an extremely low amount of emissions – for example, during rapid acceleration or at high speeds. Now it’s time to drive the spread of this capability and develop cost-effective technologies that will ensure compliance, whatever the driving conditions. Bosch presented several approaches at the International Vienna Motor Symposium that support this endeavor. Bulander put special emphasis on interlinking the domains of electrification, automation, and connectivity: “Bosch pools these aspects in the vehicle and creates ideal systems,” he said. One example of this approach is the innovative direct injection system with laser-drilled spray holes in gasoline engines. The holes’ precise edges swirl the fuel in the combustion chamber in such a way that it burns extremely efficiently. Increasing the injection pressure from 200 to 350 bar cuts particulate emissions to an even greater extent – especially under high load points and dynamic engine operation. Bosch debuted this refined version of its gasoline direct injection system at the Vienna Motor Symposium. In diesel engines, electrification reduces nitrogen oxide emissions right in the engine, making exhaust gas treatment still more efficient. Bulander demonstrated this by presenting Bosch’s new 48-volt boost recuperation system. Through the judicious application of boosts, the system can markedly reduce untreated nitrogen oxide emissions, especially at high loads or when the car is accelerating. The crucial factor here is that this effect cuts emissions directly at the point of combustion by up to 20 percent. This has the effect of significantly lowering exhaust pipe emissions: Bosch believes the system could allow the storage catalytic converter to reduce nitrogen oxide emissions by up to 80 percent. Electrification will also increase the level of efficiency for urea-based systems as well (SCR catalytic converters). These exhaust gas treatment applications consume much less AdBlue, which means the fluid doesn’t need to be refilled as often.